This is for those people who never grow out of asking questions. My sister once complained that I still ask the impossible questions, (usually related to medical subjects) that I should have stopped asking when I left my childhood. Clare is my elder by 4 years. I ‘put her through medical school’ (not really, but I was working whilst she was training) and now semi-retired, she was/is a consultant. So I expect her to know everything. At least anything to do with medicine. This book is for those of us who don’t have a geologist in the family – who should know everything to know about Geography. It is, however, by no means ‘just a Geography book’ – there is so much more to this. It is, I suspect the sort of book that will engender more questions, more ideas, more thoughts. 4th largest island in the world. Lemur – It’s a clade of primates which includes nearly 100 different species, all of them endemic to Madagascar. Vanilla – 2nd most expensive spice after saffron. Madagascar is the 2nd largest vanilla producer after Indonesia. Avenue of the Baobabs – Beautiful & famous dirt road with many prominent baobab trees lining it. I have been there and can confirm that this is so. Brookesia micra – The smallest chameleon and one of the smallest reptiles on the planet, roughly 3 cm long. It was discovered in the mid-2000’s and can only be found on the small rocky island of Nosy Hara. Gondwana – The name of the ancient (sic) supercontinent, which once included Madagascar, Antarctica, India, Africa, South America and Australia. There are a few ‘general’ pages about the globe at the beginning: Planet Earth (physical attributes), Greatest Explorers, Earthquakes & Volcanoes, Highest Mountains, Largest and Smallest Countries. 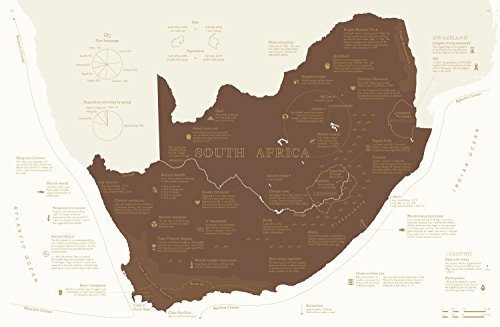 Each page includes a silhouette map of the country/ies in brown, (with a scale) and if necessary (and logically) any surrounding islands / other countries included on the same leaf. My only criticism is that it is printed in sepia and often in a very small point font – which isn’t perhaps the best colour for those with poorer eye sight, however, it is printed on cream paper and the paper is matt – not ‘Art Paper’. The book is bound in boards and measures some 34.5 cm x 27 cm (13.5 inch x 10.5 inch) – so a larger format book, necessary for such an atlas. I feel I should apologise – I have had this book for a while, but not got around to giving it the review it deserves.